Two artworks by students from a London college have gone on display in the check-in area of Heathrow airport's Terminal 5. The winning pieces were selected from ideas submitted by seven groups who competed in the Expo Award organised by BAA and Goldsmiths College. The winning pieces were titled Arc, an arch-shaped structure, and Taking Place which is an audio-visual presentation. The art installations will be on display until 31 October. The unveiling of the work of the two winning teams coincided the launch of the London Design Festival. The winning teams were mentored over an eight-week period by a former Goldsmiths student and Turner prize nominee Cathy de Monchaux and Professor of Public Art at Goldsmiths, Andrew Shoben who developed the ideas. Professor Geoffrey Crossick, Warden of Goldsmiths, said: "I'm sure that those using Terminal 5, passengers and staff alike, will find themselves stopping for a moment and engaging with these very striking works." Charles Byrne, head of sponsorship and experience at BAA, said: "We are using the Expo programme at our airports to showcase and support the great variety of talent we have in the UK. 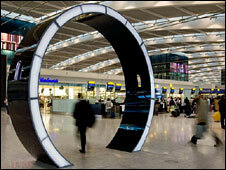 As the world's busiest international airport Heathrow provides an ideal platform for this."